Who IS One String Willie? As One String Willie, I make music on the one-string diddley bow, beating out a rhythm on the single wire string, while changing its pitch with a flat glass bottle slide. 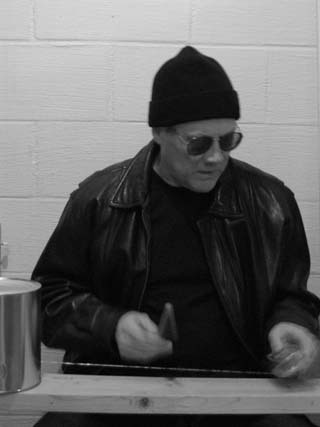 I am working to explore the limits of this primal instrument by moving beyond traditional playing styles. I invite you to turn off from the main musical highway by building your own diddley bow and then teaching yourself to play it. I invite you to search out new musical paths or old ones that were lost and all but forgotten. There are no "rules" for playing this instrument--you can take the time to work out for yourself the different ways to make sounds come from a single string, and to integrate these sounds into your own music. You will then have something that is satisfyingly and uniquely your own. The diddley bow is of African-American origin, probably developed from instruments found on the Ghana coast of west Africa. The diddley bow is rarely heard outside the rural south. 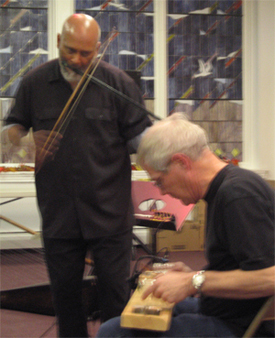 Other nicknames for this instrument include “jitterbug” or “one-string,” while an ethnomusicologist would formally call it a “monochord zither.” The diddley bow has traditionally been considered an "entry-level" instrument, normally played by adolescent boys, who then graduate to a "normal" guitar if they show promise on the diddley bow. Many famous blues guitarists started out on a diddley bow, but because it was considered a children's instrument, very few musicians continued to play the diddley bow once they reached adulthood. The diddley bow is therefore not well represented in recordings. As of this writing, the commercially available recordings of traditional diddley bow players might fill two CDs, but would not fill three. With the information on this site, it is possible to build a perfectly good basic diddley bow in about 5 minutes if you have all the pieces and tools handy. A portable version is made from a board with an nail driven into each end, a piece of steel wire stretched between the two nails and tensioned by slipping a small jar or bottle under the string and pushing it as close to one of the nails as possible. A small scrap of wood is slipped under the string and pushed as close to the other nail as possible. Traditionally, the string is struck in a rhythmic manner with a finger or a stick or some other implement, and the pitch of the string is altered by using a slide made of glass, metal or some other hard substance. A diddley bow is slide guitar stripped down to its most elemental level. I have obtained a quantity of unused, tin coated standard steel broom wire (18-1/2 gauge, 135,000 psi tensile strength) and am offering it in 23-25 foot lengths through my store on etsy.com. This should be enough wire to make approximately seven medium-sized diddley bows. Look under "Make a Diddley Bow" for the "Wire for the String" page. I have also written two articles in Issue 23 of Make Magazine: one on building a diddley bow with an improved method of establishing position marks http://makeprojects.com/Project/Making-a-Diddley-Bow/14/1 , and one on winding your own electomagnetic pickups on sewing machine bobbins, and have been interviewed for a book by Mark Frauenfelder, Made By Hand: Searching for Meaning in a Throwaway World. I am in a recently released book by David Sutton, Cigar Box Guitars: The Ultimate DIY Guide for the Makers and Players of the Handmade Music Revolution. This book has a chapter on how I build my own electromagnetic pickups on sewing machine bobbins. Check it out!